For those who don’t know, a fitness tracker is an electronic bracelet or watch that can track a person’s activities, such as the number of steps, how far they walked, calories burned etc. The tracker usually works in conjunction to a smartphone app so the user can keep a record of their daily activities over a range of time. Fitbit is probably the most recognizable brand in this segment, but Garmin, known for their GPS units, also have their own line of fitness trackers. The Garmin units seems to priced a little lower than comparable Fitbits. 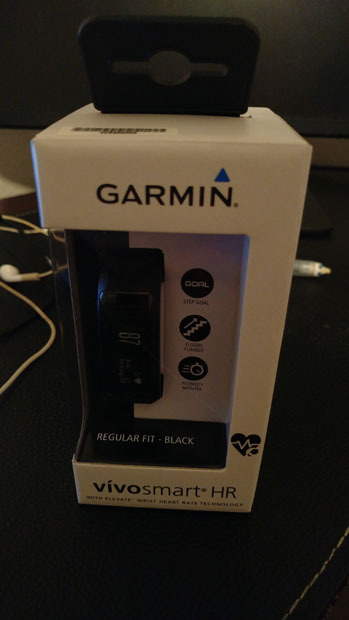 I bought the Vivosmart HR because it had heart rate monitoring, was waterproof, and was on sale during Black Friday. 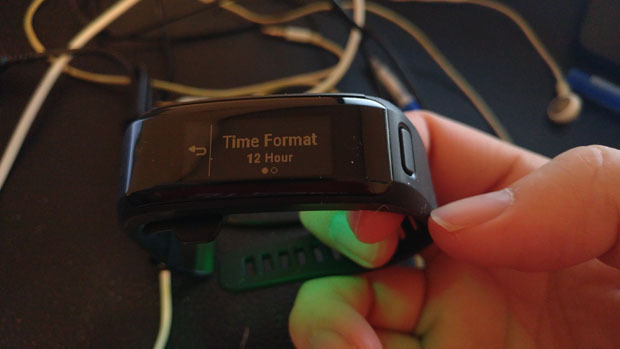 The Vivosmart HR came in a small white box which showed off the fitness tracker in a plastic window. Inside the box, you’ll find the Vivosmart HR itself, the charger, and some paper pamphlets with warranty and quick start info. As with many small electronic gadgets these days, the charger ends in a USB port and no wall plug is supplied. The manufacturers assume you have a computer with USB ports, and in most cases they’d be correct. The charger clips in at the bottom of the Vivosmart HR. The unit contains a rechargeable battery that lasts 4-5 days on a full charge. 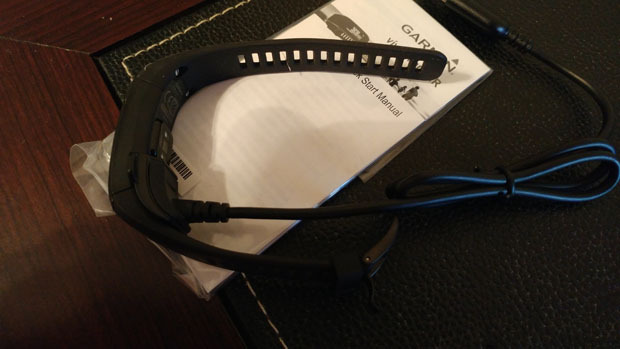 I bought the black Vivosmart HR with regular band size. There are other colors available (blue and purple I believe), and those with extra-thick forearms can get a model with the extra large band. The Vivosmart HR is about 2 cm wide, and is about 1 cm thick at the thickest part. It’s not heavy or overly large, but I definitely feel it when I wear it. Most of the unit is matte black except for the main face which is glossy. It looks good at first, but after using the tracker for a week, I find that the glossy face gets scratched and scuffed pretty easily. I already done some damage, and I don’t think I was that rough with the unit. The main interface consists of a monochrome LCD touch screen that’s about 3 cm diagonal, plus one physical button. The main screen has a back light that activates when you touch the screen, or if you move your wrist in a certain way. The main screen shows the time and date, and one can swipe left and right to cycle through the screen, which are steps, flights of stairs, activity minutes per week, calories burned, miles moved, controls for music, weather, notifications, and heart rate. Pressing the button leads to the utilities menu, which one can modify the settings of the Vivosmart HR or start the procedure to pair with a smartphone. 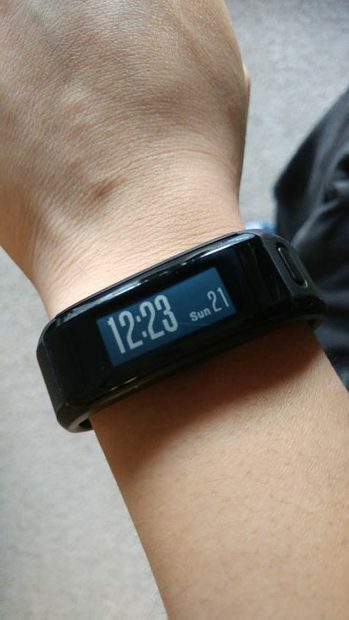 Features such as weather and notifications only work when the Vivosmart is paired to a smartphone. I found the interface to be intuitive and not to hard to learn. 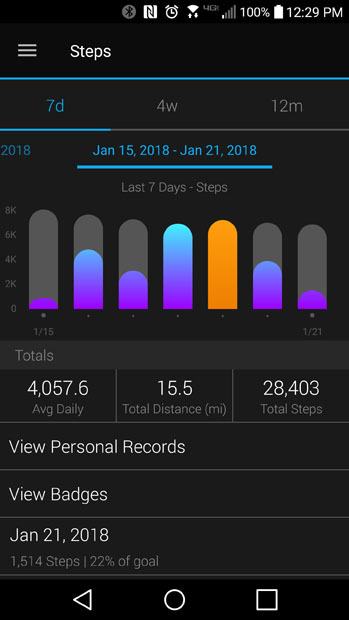 To get the Vivosmart HR to work properly, I had to download the Garmin Connect app on my smartphone. The Vivosmart HR connects to smartphone via Bluetooth, but pairing can only be done through the Garmin Connect app. I also need to register for a Garmin Connect account. 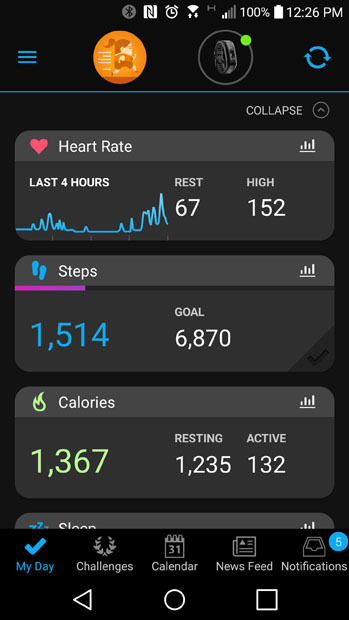 Once all that set up is done, I can open the Garmin Connect app and see all of activity tracker number shown on the Vivosmart HR itself, but with nice colorful graphs and averages. In addition, one neat feature I like about the Vivosmart HR is its ability to track sleep. Based on your movements, the Vivosmart HR can track if you are deep sleep, light sleep or awake, but you can only see this info in the Garmin Connect app. After a week of using the Vivosmart HR, I found the activity tracking to be fairly accurate. The most accurate seems to be the number of flights of stairs climbed. The heart rate monitor numbers also seem high some of the time, but on average it seems to reasonably accurate at least as to when my heart rate is elevated and when it is not. The step tracking is okay, but the number is a bit inflated as it seems to be mainly based on arm movements. I noticed that the number would go up when I brush my teeth with the arm wearing the tracker. So far, the Vivosmart HR has worked pretty well. It’s a neat little gadget that works as advertised. Looking at my activities is informative, but I don’t know how much I will act on that information. The tracker has been mostly problem free. The only hiccup I ran into was when I was trying to set up the unit for myself. 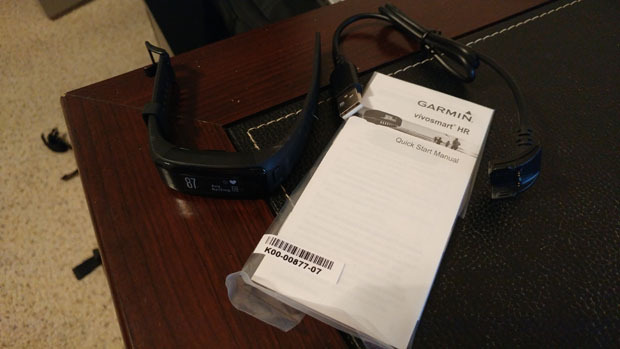 I had set it up for my dad before, and I had to go into this Garmin Connect account and remove this unit before it can work properly with my own Garmin Connect account. It also took a little bit getting used to wearing a fitness tracker all day including during sleep hours, especially because I haven’t worn a watch regularly for at least a decade. It’s not the most comfortable watch due to its shape and the protruding heart rate sensor, but I’m staring to get used to it. Hopefully the Vivosmart HR will last a long time, although gadgets like this will inevitably take quite a bit of abuse, so I’ll find out how durable this thing really is.